After releasing Mario from the necessity of proposing before he left, the final few days suddenly became much more intriguing. What would he decide? Would he still decide to do it now? Or would he wait? It made sense that he would want to propose in his own country, where he could set it up exactly as he wanted. I wasn’t sure what to expect. I knew that any moment, he could ask the question that would change both of our lives forever. But I also knew that the probability of him waiting was high. And I wanted to be careful that I wouldn’t be disappointed if he returned to Italy with the ring in his pocket. Monday morning arrived. Mario was leaving on a Wednesday night plane, so we had less than 72 hours left in his visit. I wanted to take advantage of every moment, but a work crisis hit and I had to go into the theatre. What I thought would be just an hour dragged into 2…and then 3. Mario and I kept missing each other on the phone and the poor man waited outside, in my car, for over an hour thinking it was time to pick me up. Finally he drove back to my house only to have me call him and tell him that I was ready. As he greeted me at the theatre, Mario took my phone in order to check something. In the process, he hit a combination of buttons that caused my phone to start speaking to me. About everything. In a very annoying voice. All during the car ride back to the house, I tried to figure out what he had done, and how to turn the voice off. But to no avail. It seemed irreversible. As I walked into the house, Mario tried to convince me to put the phone away, to worry about it later. As had become our routine, he had made us lunch, and he wanted us to sit down before the food got cold. But I refused. I was determined that I could fix it. Mario asked again, saying we would try again after lunch, but I insisted that if I could just have a few more minutes, I could figure it out. Mario gently pried the phone from my grip, told me to stop worrying about it, and pulled me to the table. The table was beautifully set. Mario had picked some flowers from the neighborhood and had music playing softly in the background. As he led me to my chair I saw the most amazing sight. On my plate, Mario had written a message. In balsamic vinegar. I melted. It was such a sweet gesture. And so…Italian. As I gushed over his handy work, Mario started dishing up our lunch. 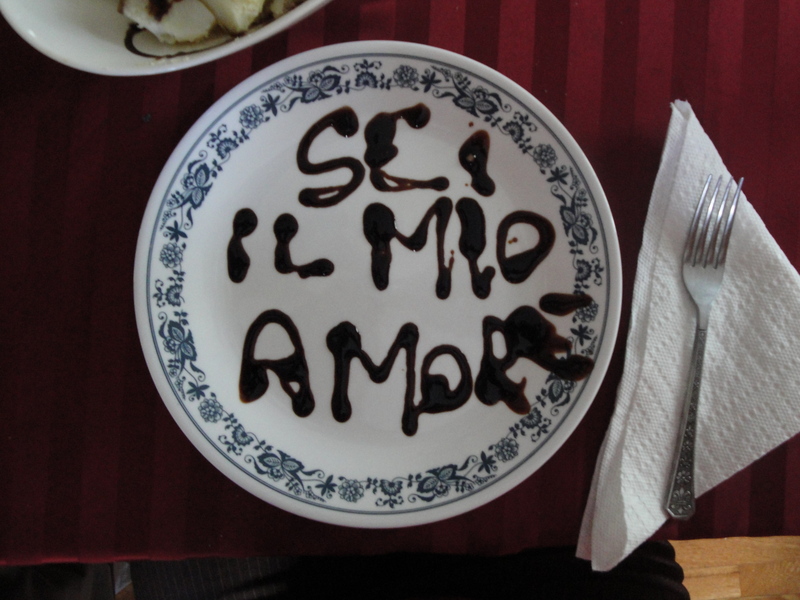 As only an Italian would, he had made a potato dish that was meant to be drizzled in balsamic vinegar, which meant it went perfectly with my decorated plate. As we proceeded through the courses, I was overwhelmed with love for the man sitting across from me. How blessed I had been to meet him. How much I was grateful for our relationship, as crazy as it was. Then, the thought hit me. I wish he would just propose right now. I almost jumped out of my chair. The thought was so forceful in my mind I was afraid that I had spoken out loud. Mario looked at me curiously, but I just smiled, leaned over and kissed him, and continued eating. You see, even though I had these thoughts, even though we had had multiple talks about getting married and our future together, there was still one major obstacle to my actually accepting a proposal from Mario. He had yet to tell me that he love me. We lingered over the meal, neither of us wanting to break the mood that had settled over us. Finally, reluctantly, I stood up to start clearing the table. But Mario pulled me back into my seat, telling me that it could wait until later. I looked at him curiously, but he just smiled nervously, kissed me, and pulled me into the living room. I had never seen Mario like this. With his quick smile and easy laugh, Mario normally exuded confidence. At the moment he looked…terrified. Mario stopped me in the middle of the living room and pulled me into his arms. Unable to look me in the eyes, me buried his face in my neck. And he started talking. Talking about all the things about me that he found so special. Everything from my personality, to my beliefs, to my dreams and ambitions – all the things that made me, ME. How he had never met another women like me and how grateful he was that we had met. And he pulled me even closer. And at that fateful moment, my roommate walked through the front door. Mario froze. And then he let out a frustrated sigh. As my roommate took in the situation, Mario grabbed my hand and before I could give her a proper hello, pulled me up the stairs to my room and closed the door. Then he pulled me right back into his arms, once again burying his face into my neck, and started talking again. Repeating so many things that he had said downstairs. Until he arrived at the same moment. Bella mia…non ho mai detto questo a nessuna donna. Ma lo sento con tutto il mio cuore. E voglio dirtelo. Devo diretlo. Ti amo. Mario crushed me in his embrace and tears burned my eyelids. It was perfect. This was what I had needed to hear before he left. With this assurance I knew I could get through the next few months until we would see each other again. Everything else could wait. Finally, through my delirious happiness, I noticed that Mario had once again tensed. As I looked at him curiously, he once again smiled nervously, and pushed me back until I was sitting at the foot of my bed. This entry was posted in 2010, Choices, DC, Italy, Mario and tagged best friends, Choices, DC, engagement ring, happiness, Italian, Italy, joy, love, Mario, memoir, memories, relationships, romance, Washington DC. Bookmark the permalink.